Black Friday comes on Nov.24th, the day after Thanksgiving! Many of you must be immersed in the festival atmosphere while going on the crazy shopping sprees. 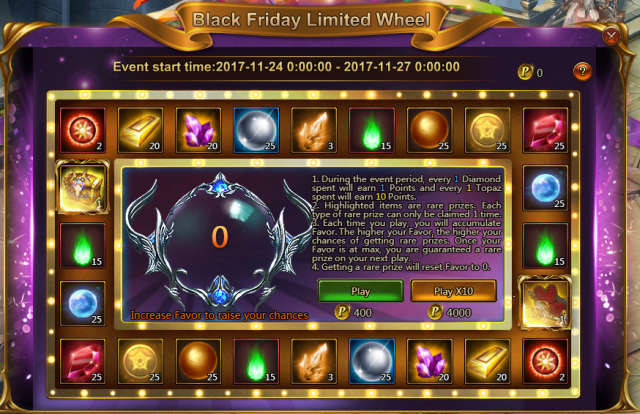 To make you feel continuous joy, League of Angels II not only gives away tons of free gifts, also introduces a brand new event called Black Friday Limited Wheel from which players can get some rare items like the new Mount Moonlight Carriage, Artifact Armaments, Artifact Minion cards, and more. It’s all about deals and sales! Let’s learn more details about this event below. Server: The servers opened more than 7 days. During the event period, players will earn Points through spending Diamonds or Topaz, and the Points can be used to play the Wheel for some resources and rare prizes. The more times you play, the more Favor you will collect and the higher chance for you to get rare items. 1.Highlighted items are rare prizes. Each type of rare prize can only be claimed 1 time. 2.Once your Favor is at max, you are guaranteed a rare prize on your next play. 3.Getting a rare prize will reset Favor to 0. 4.Once all rare prizes are claimed, you will not gain any more Favor from playing. * Please note that the items in the picture above might be adjusted due to changes of the development plan. Final updates will be determined in game. A special new mount Moonlight Carriage has debuted on Sapphire. Driven by two elegant white horses and elaborately decorated with red roses and ribbons, Moonlight Carriage completely reveals romance and grace. It is said that Moonlight Carriage symbolizes romantic love and happiness and it can help its owner find his or her true love. Check out more about this new mount below. Moonlight Carriage is an Artifact mount. It can not only help increase ATK and HP, but also dispel negative effects. Let’s check out its unique skills in details. Hand in Hand (Max Level): At start of battle, increase ATK and Hit of entire squad by 29% and max HP by 29% for 5 turns. Enduring Love (Max Level): Before performing an action each turn, restore 50% of his missing HP to the ally with the lowest HP and dispel all negative effects. From Nov. 14th to Nov. 27th, Moonlight Carriage will be available in Black Friday Event in game. 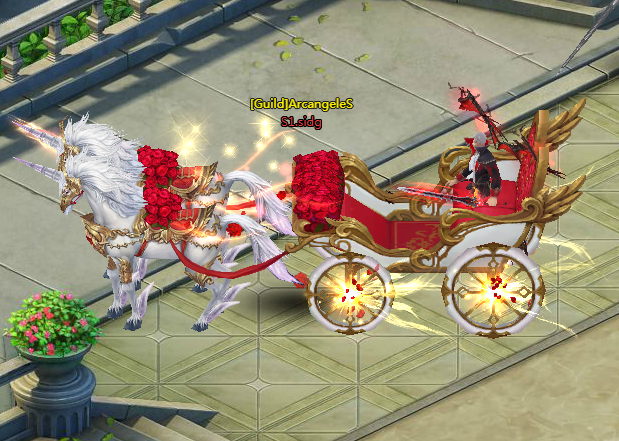 Don’t miss the chance to get this romantic carriage and take a ride on it around Sapphire! Stay tuned for more great content coming to League of Angels II, and as always, we hope you’re having a wonderful time in Sapphire! Last：Preview on 7-Day Carnival for New Servers-Recharge! Next：New Event First Purchase Chest: Get Angel’s Treasure Timely!